I really liked the blurb of this book, as well as the front cover. 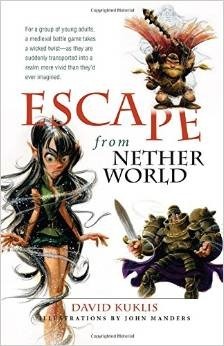 While the plot wasn’t an entirely unique one, I thought it was an interesting twist on the ‘person/group of people find themselves in another world’. I did think it was interesting to see the characters and how capable they were when they were playing the game. While I’ve never LARP-ed myself, I didn’t have any problem picturing the teams in my mind. What I didn’t like, however, was the listing off of the characters… and that I had no idea what any of them looked like, which made it difficult to differentiate between them at times. While it was good to see that the characters had different names, it would have been good to see more explanations as to why some of them were chosen. I did feel that the plot was very simplistic in places. There was a lot of potential, but I felt that the connections between many of the characters weren’t given the time to develop. I felt that Raina especially wasn’t given much of a personality outside of her crush on Bohair… and speaking of Bohair, I actually didn’t like him very much by the end of the book. At the same time, I thought that Piper’s changed feelings towards Bohair were random and not foreshadowed at all. There were some quite good elements in this book, especially where the fight scenes were concerned. However, I found it very difficult to believe the characters from modern-day Earth could defeat warriors apparently training for actual fighting in a fantasy world. I was also disappointed not to see much of a culture shock… or for the characters to have any sort of reaction to actually having to kill people. I would have liked to see more of the world and the interactions expanded upon, rather than glossed over. I found it very difficult to care about the characters who were wounded, because I hadn’t connected emotionally to them. As it stands, I don’t think I’ll read a sequel to this book, since I found it difficult to connect to the characters… but I would read one if it was changed and expanded upon, allowing me to connect to the characters and care about them.